Search engines are perpetually making changes to their algorithms to focus on providing the most relevant content to today’s more “intent” focused searches, rather than just blindly rank content on a simple keyword basis. But what does this mean for you as a marketer and/or content creator? The emergence of topic-based content. In simple terms, Google has begun favoring topic-based content. This has led to the emergence of topic cluster models in content marketing, where SEOs can leverage internal and relevant linking to boost certain topic SERPs. This is oftentimes a page that acts as a central hub that explains a core topic in more detail. For example, let’s say that our content pillar is SEO. The second piece of the puzzle is a subtopic. These are basically content pieces that are related to the pillar. 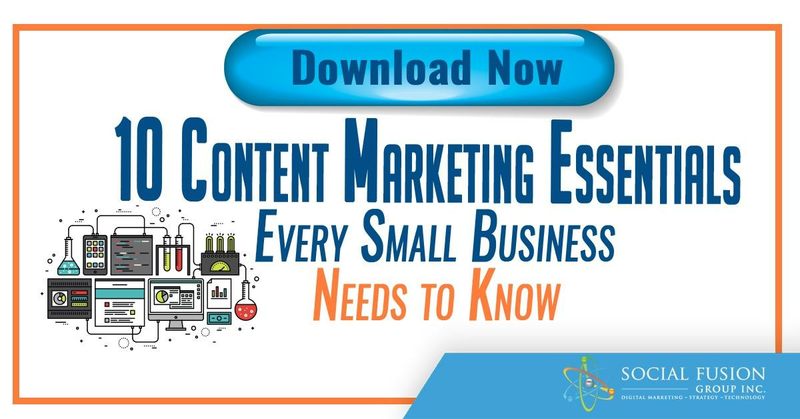 For instance, “10 SEO Strategies,” “How to measure ROI from SEO,” “SEO vs PPC” are all subtopics to the content pillar. These subtopics link back to the main page, essentially creating a cluster that focuses on all you need to know about a specific topic. 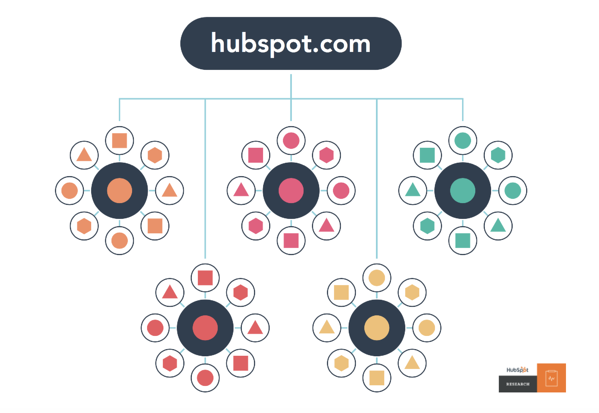 If you still need some explaining, HubSpot has a great and simple video underlining how the cluster methodology works. This linking action is not only to guide your audience to and from relevant content pieces, it also helps you keep your site clean and organized, making navigation an easy and pleasant experience for visitors. More importantly, the internal linking structure of a cluster model is a strong indication that the central page or “pillar” is an authority on the topic. This is something search engines take into consideration, and might even increase the page’s rankings over time. If a continuous strong signal is sent to search engines that the pillar page is an authority on the topic, over time, the page may start to rank higher and higher for the topic. While this is (somewhat) acceptable for a site with very few posts, as more content is created, it just becomes “chaos” with no actual organization. This not only takes away from the user experience, it also makes it much harder for search engines to sift through, and quickly crawl your pages, which can lead to potentially reduced SERPs. Another important thing to note is that, as you create content around a similar topic, on a pure keyword model, these posts will eventually begin to compete with themselves to get found by your audience, and search engines; ultimately leading to a form of cannibalization. With topic clusters, everything is organized, and arranged in a way that lets search engines know which posts should be prioritized and displayed for the main topic, and organizes all the pages related to that pillar in one interlinked cluster like seen below. 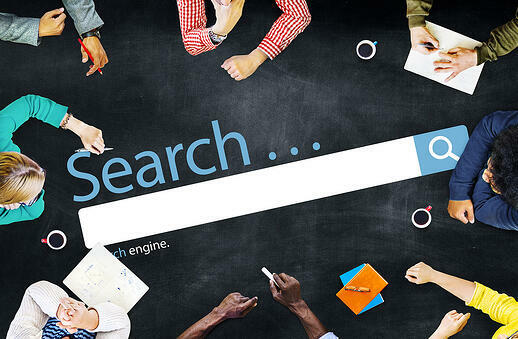 The above illustration shows search engines that there is true breadth and depth surrounding a central topic, which in turn can also do wonders for your authority. Search engines take everything into consideration. 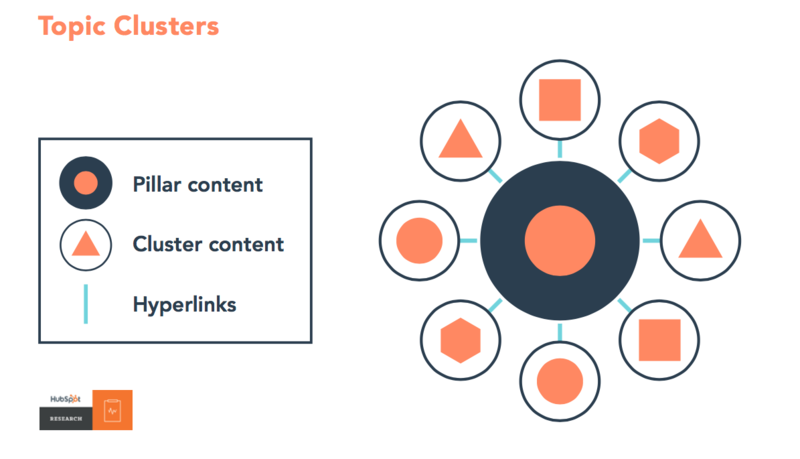 Shifting to topic cluster model can be beneficial for your content marketing efforts and can reward you with healthier SERPs. So How To Create A Topic Cluster? The first and most important thing to do when creating a topic cluster is determining your pillar. Typically, most of us probably immediately go do some keyword research. While this is in fact needed (and important), it is not the whole story. You'll also need to start thinking about topics. This could be either from longtail keywords, trending subjects in your niche, or something that is evergreen and always evolving. Whichever the case, your pillar needs to focus on the main topic. On the subject of pillars, note that it will need to cover a core topic that is broad enough to have the subtopics link back to it. Another good determinant of a content acting as a pillar is its ability to answer all possible questions for a specific topic. This is what will make it suitable for tying all other related content. Remember: The pillar needs to be broad, so if you see a post/page is focused on a specific longtail keyword then it is not suitable to be a pillar. The next step would be to create content on those subtopics, and ultimately link back to the pillar page to finalize your cluster. If you already have relevant content, be sure to update it by including an internal link back to the core pillar. Note: When linking content together, each piece of the cluster needs to be linked at least once with the same anchor text in order to let search engines know that they are all part of the same topic cluster. If your company has fairly few content pieces, creating content pillars can be a quick and easy way of organizing your posts. If however, you have a massive inventory of hundreds of pieces, this process can be downright painful. So, what can you do? Step 1: Map out the core problems you aim to solve for your personas. Step 4: If you don’t have one already, create a pillar post that encompasses all potential answers for the core interests of your audience. The above steps are in fact all manual and might take some time to finalize. If you want to shed some time off the process, you can consider using a tool to make linking, searching, and visualizing everything much faster (and easier). 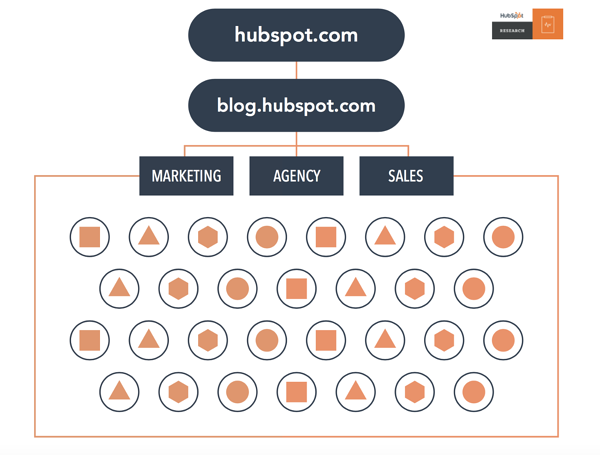 One of our personal favorites (and one we are using at the moment) is HubSpot’s Content Strategy tool. While this will boost the efficiency of the process significantly, it will still require some time on your part. However, creating clusters is a very worthwhile investment that will not only boost your SERPs, it will also make for a much better user experience on your site.